Gettysburg Foundation - Plan your perfect adventure! The National Park Service (NPS) recommends starting your visit to Gettysburg at the Gettysburg National Military Park Museum & Visitor Center. The Gettysburg Foundation is a non-profit philanthropic, educational organization operating in partnership with the National Park Service to preserve Gettysburg National Military Park and the Eisenhower National Historic Site, and to educate the public about their significance. The Foundation operates the Museum & Visitor Center and supports NPS to preserve the Gettysburg battlefield, care for its monuments, acquire historical artifacts and educate visitors. First, see the film, A New Birth of Freedom, which sets the stage for your Gettysburg visit. After the film, make your way to the Cyclorama painting platform. 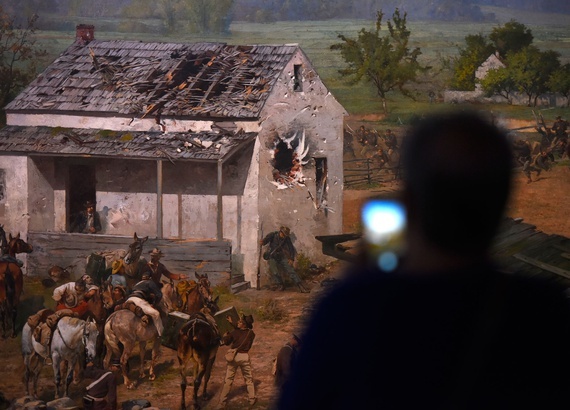 The historic Gettysburg Cyclorama painting, fully restored to its original, 1884 appearance, includes a sound and light show that immerses visitors in the fury of Pickett’s Charge and describes the battle itself. Cycloramas—paintings in the round—were the IMAX of their day and visitors are as amazed today as they were in 1884. The Gettysburg Cyclorama weighs 12.5 tons and is longer than a football field. It is one of only two in North America. Visitor services representative are also on hand to answer your questions. 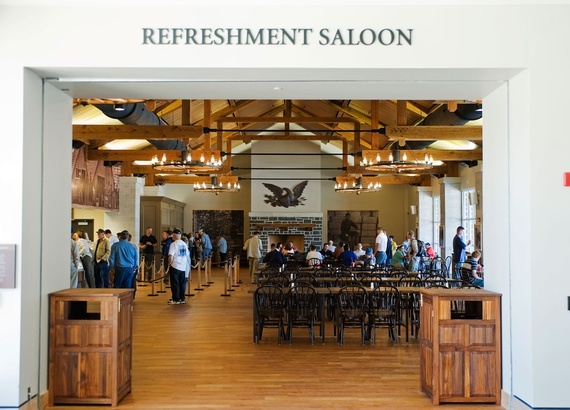 After seeing the film and Cyclorama, take a coffee break at the Battleground Café or have a leisurely lunch in the Refreshment Saloon, modeled after an actual Civil War-era saloon. If you haven’t already booked your battlefield tour, visit the ticket counter in the Museum & Visitor Center, where you can choose from a bus tour or a private tour in your own vehicle with a Licensed Battlefield Guide; or an auto CD tour, available for purchase in the Museum Bookstore. 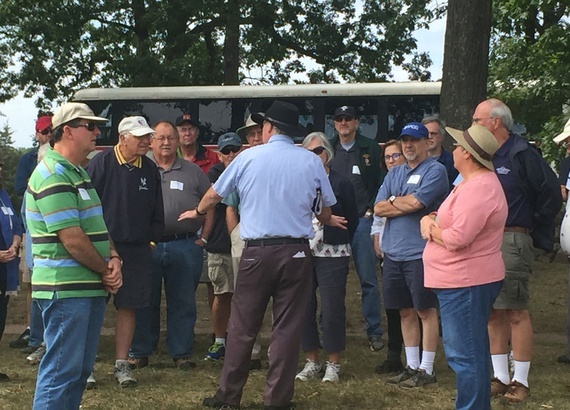 Licensed Battlefield Guides train for years and must pass extensive testing administered by the National Park Service to qualify to guide tours. Bus tours and car tours with Licensed Battlefield Guides are in demand, especially during the summer months. To avoid disappointment, schedule your tour at least three days in advance. Bus tours can be booked online or by calling our Reservations Department at 877- 874-2478. Private car tours with an LBG can only be booked by calling the Reservations Department at 877-874-2478. 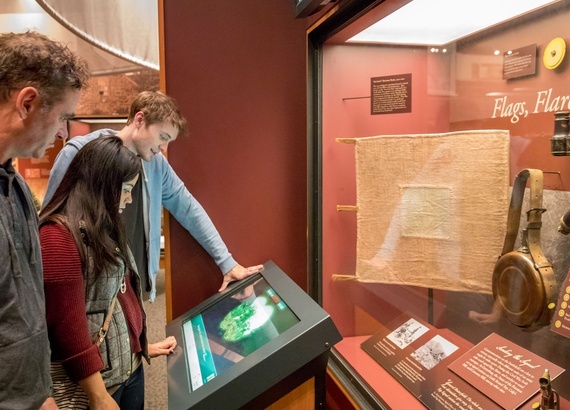 Spend some time exploring the museum as part of your Film, Cyclorama & Museum Experience ticket, or with a Museum Experience ticket. Inside are interactive and multimedia exhibits, short films, artifacts and information about the Civil War and the Battle of Gettysburg. 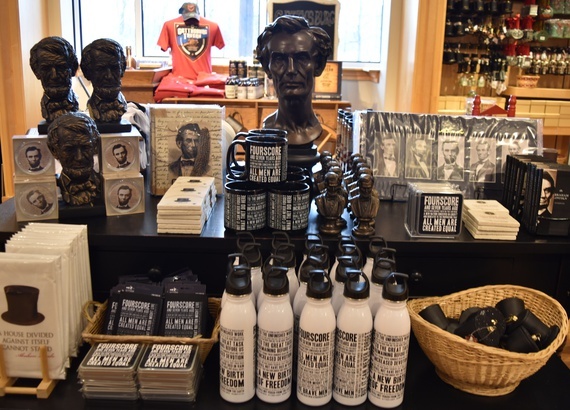 Browse the extensive selection of Gettysburg and Civil War-era books and souvenirs. The bookstore contains Civil War-themed field maps, history books, music and DVDs, clothing and jewelry, posters and prints, mugs, and even toys and games for kids. Locally made, Mr. Ed’s fudge is always popular. 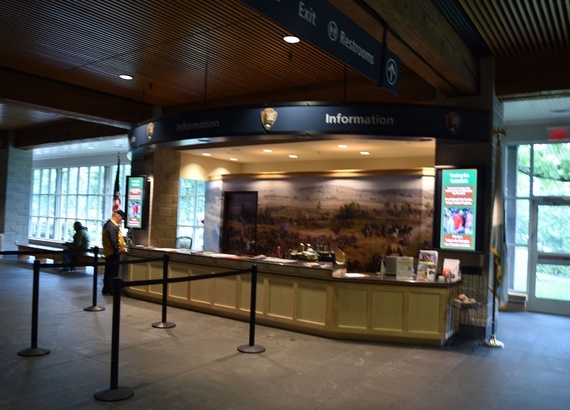 Stop at the information desk to check the schedule of National Park Service Ranger programs. Numerous programs are offered each day during the summer, including battlefield walks, where you can hike the trails on the 6,000-acre battlefield. For example, you can walk the fields from Seminary Ridge to Cemetery Hill, where thousands of Confederates attacked the Union line on the third day during Pickett’s Charge. Special programming is available throughout the year. Check the event schedule for details. See where Abraham Lincoln gave the Gettysburg Address and reflect on the soldiers who fought at Gettysburg. National Park Service Ranger–led walking tours are available seasonally; information is available at the Ranger desk in the Museum & Visitor Center and online. You can walk to the cemetery by parking your car at the Museum & Visitor Center and following the clearly marked trail. Visit the only home President and Mrs. Eisenhower ever owned, located adjacent to the battlefield. Access is via shuttle from the Museum & Visitor Center. Purchase tickets at the ticket counter. 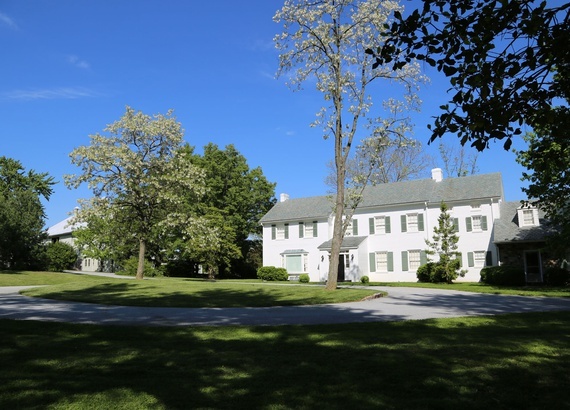 Once there, you can tour the former president’s home, take a self-guided walk around the farm, where President Eisenhower bred and showed prize-winning black Angus cattle, or learn about 1950s Secret Service operations and Eisenhower’s role in World War II with a National Park Service Ranger. 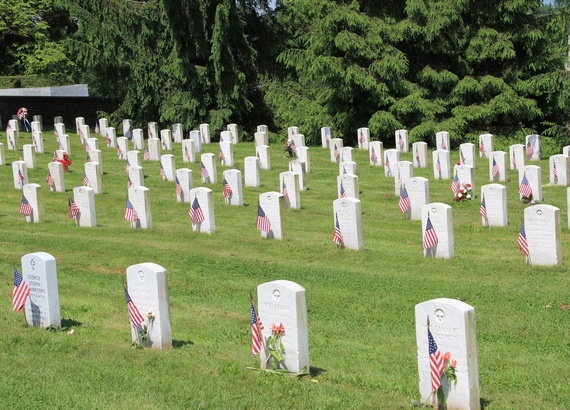 Here, you will learn about the aftermath of the Battle of Gettysburg, the establishment of the Soldiers’ National Cemetery and President Lincoln’s visit to the Wills family. While visiting the night before dedicating the Soldiers’ National Cemetery, Abraham Lincoln put the finishing touches on his “few remarks” that would become known as the Gettysburg Address. This National Park Service museum is located at 8 Lincoln Square in downtown Gettysburg. 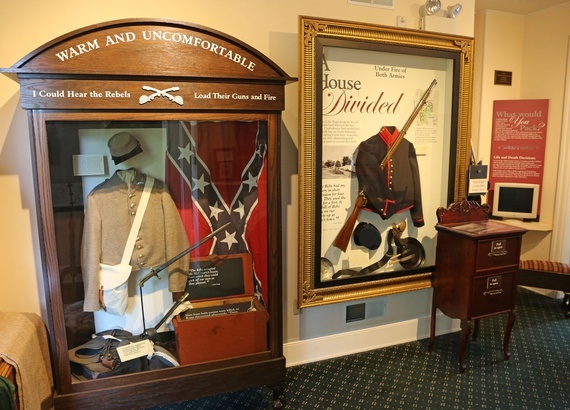 Purchase tickets to tour the home at GettysburgFoundation.org, by calling the Reservations Department at 877-874-2478, at the ticket counter inside the Gettysburg National Military Park Museum & Visitor Center. Walk in Lincoln’s footsteps from the Gettysburg Lincoln Railroad StationTM, a block away or take advantage of free shuttle service from the Gettysburg National Military Park Museum & Visitor Center. The historic Rupp House History Center at 451 Baltimore Street in downtown Gettysburg serves as the headquarters of the Friends of Gettysburg. You can learn about civilian life in Gettysburg during and after the battle in the museum on the ground floor of the Rupp House History Center and support preservation of the battlefield by becoming a member of the Friends of Gettysburg. Admission to the museum is free.